Mexico 2011 and Bahrain project. Scott left for Bahrain on Feb. 2 without his assistant. But don’t feel too sorry for me, as I sit in a Caribbean vacation resort. If I have to be somewhere all by myself, Puerto Isla Mujeres is a great place to be. Scott took the GPS Spot and set it off at each destination along the way. It is amazing to me to see that he is almost at the same latitude just many longitudinal minutes away. Scott got to the job and as usual he is there early. The new drillers chair (shown above), which he was to help install on this project, didn't arrive till the 3rd week he was there. It was suppose to be there before he got there. Scott goes to the Middle East and the unrest begins as we watch the news in Egypt. The first rig Cindy worked on, the J.P. Bussell, was now in Alexandria, Egypt and they evacuated the rig and welded shut all the doors as they left. Then the unrest spread to Bahrain. The rig did have Scott leave The Crowne Plaza Bahrain and had him move on the rig just to be safe. As Scott said "if they have to they can always jack up". LOL The rig is also in a shipyard nearby the American Fifth Fleet. So he really is in a safe place to be during the protests. He only spent two days on the rig and moved back to the hotel. They also sent a rescue team to go back to the rig in Egypt. Scott wasn’t asked, he better not get to get the Egypt stamp (the number 1 place in the world I want to visit) without me, but he did send our SAT phone with them just in case they may need it. Scott never did see any of the protests, since they were on the other side of the island, but he did get caught in the traffic. So back to the tourist…Cindy is loving walking and biking all over the island. With one nights notice, Patti, Cindy’s HS Drama teacher, was on her way to Cancun on Feb. 10. Yeah! Luckily time to rearrange the boat so there was a state room ready for a guest. Cindy went over to the mainland, with John and Betty off of Second Wind a British boat we first heard and saw on the Rio, for a morning shopping tour. After finding all that I could carry, off I went to the airport. When I got there, I found out that Patti’s flight was delayed. So there I sat taking in all the sights of Cancun Airport, which ended up being quite a few very large guys who had to be professional football players who, I can only assume, were there to vacation with their wives for Valentine’s Day. Finally her plane landed and she came through the doors. Now the rest of the story….she had gotten on an earlier flight and been waiting at luggage claim for all that time waiting for her bag to come on her original flight. local tourist traps. One of Patti’s request of me was to make her lasagna because the first time back in HS I had invited Patti to the farm she requested lasagna for the meal. So I hit the cookbooks and made it for the first time. Now, thirty years later, again success, even when making it on the boat with Mexican products. The ten days went way too fast and off we were on the ferry to get Patti to the airport. On the way I asked the taxi driver if he could take me to the airport and then to Sam’s to do some shopping. He said that there was a problem with that because if he got caught leaving the airport with a passenger it would be a $3,000 fine. As we arrived at the airport, he told me that he would wait but not to talk to anyone, I hadn’t paid him so I knew he would still be there. In we went and I had to say Good-bye to my best sister-friend-mentor in the world. So back in the taxi and he explained that he would have to explain to the security that I had made a mistake and I needed the other terminal. A few seconds later he told me to duck and stay down until he told me to get back up, which I did. Always love a mid morning nap ;) So a few minutes later, I was allowed to sit up not believing that he would risk the fine just to keep me in his cab. Off we went to Sam’s and Wal-Mart with my taxi driver right beside me pushing the cart and both of us practicing Spanish/English. As I went off to pay he even went back to get help in finding something I had forgotten. I guess spending a few hours with a gringa was more exciting then a normal Tuesday morning. Back to the boat and one night spent alone and then my next guest arrived on the island. Wendy’s here! Wendy and I went to HS together. We had become friends on FB right after we had passed through MI on The Great Loop Trip. Finding that we have many common interests, we have been keeping in touch. Finding that she had some vacation time and I had a spare state room, so come on down she did. So what do you do in a Mexican Tourist Resort/Marina??? . . _______ Go Snorkeling and of course Eating!
. - We also attended the Oscar’s viewing party at Jax with fellow vacationers (we had enjoyed many wonderful hours at the pool with) Steve and Connie from Washington state.
. But don’t try to order Potato Soup…when it comes to the table it will just be a baked potato. Then, the next day it was time for Wendy to go back home. It was great having both Patti and Wendy here to do things with and enjoy the island with someone else. Now it is back to being alone. What is an average day??? Get up and exercise alternating between biking and walking. Once back have breakfast and listen to the I de M Cruisers Net and read the USA Today. Think about what one project I would like to do on the boat today. Watch a little Morning TV, talk shows, or watch a movie. Whichever is working because it changes here day to day because the cable is screwy! One day only movie channels, the next day a couple of the channels with the wrong sound, a few days after that, pictures with a cable reminder screen covering half the picture. But anything is better than nothing. Go to the pool either before noon to get a chair before the tourists catamarans from Cancun get here for lunch or wait until after 3 when they leave. Read and work on the tan. Talk to Scott, remembering the 9 hour difference, and keeping updated on FB and the news on the internet, especially the political unrest in Bahrain. Finally think about what I should do for my 50th birthday in a week???!!!!????
. Luckily with all the unrest in Bahrain, Scott was able to surprise me with a trip home for my birthday. A great day was spent doing all my favorites, seafood benedict at Mango Café for breakfast and lobster dinner.
. The day after my birthday was Mardi Gras and we spent a great day celebrating with fellow cruiser, Skip from Java Moon, whom we have been traveling off and on with since last June.
. Next, off we went on an ADO bus to Puerto Morelos to visit Jerry and Deborah on Czech and Mate and to look at his flux gate auto pilot compass. The compass was broken, but the Chinese food and night spent on their boat was wonderful. Since they had rented a car, we hitched a ride back to Cancun, with stops at Home Depot and looking for a new Mexican flag. They dropped us off at the ferry and home they went to El Cid to get ready for their entire family to come tomorrow for a week visit.
. The past few weeks I have been boat watching for Lorena, whose homeport is Galveston. We had first admired the boat on the hard at Ram Marine in the Rio Dulce. They had to repair some damages acquired during their crossing and we enjoyed being a part of the process with Jim and crew. A couple more proof of dinners with cruising friends.
. Lorena and Dream Away, last seen as Papa Noel the Rio, on the final night of Millagro’s Pizza. Last year as we were sitting here at anchor in the harbor we had heard of people heading to Chichen Itza to see the Spring Equinox, one of the New Seven Wonders of the World. Since we were sitting here in a marina, this year we had no excuse not to go. Again, we were lucky to have been told by a fellow cruiser to spend the extra money and stay at the hotel right next to the ruins. So we followed their advice and planned another Ado bus trip. We got their just after lunch and spent the afternoon getting to know the hotel grounds and avoiding the 40,000+ visitors that were at the ruins. A great romantic getaway and blessed somehow with a jacuzzi room upgrade. That night we went to the light and sound show. The next morning we went and toured the ruins when the park opened so that we avoided the crowds. It was great getting pictures with no one else in them.
. The old entrance to town. The name Chichen-Itza was derived from Mayan word. The CHI means mouth, the CHEN means well and the ITZA means the tribe. Here we are right above the well that it is named after.
. My favorite Shot. We were pleasantly surprised to see the two practice temples found in the ruins. 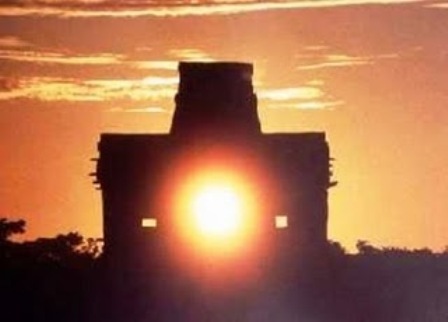 Even the Mayans didn’t get it right the first time they built it and the observatory. You may want to turn off the sound and just read the titles.
. Yes, we were there and we saw it in all it’s amazing glory! Another wonderful night and bath, of course. ;) The next morning after breakfast we bused it back to the boat bringing an end to another wonderful adventure away from the boat. (finally a we remembered to take a picture of the new Sun Shade we had made in the Rio) and waiting for word for Scott to head back to Bahrain. I kept waiting for a rainy day to update the website….No rain for the last 5 weeks, so I had to go ahead and spend a couple beautiful days inside the boat catching it up so Scott could get it uploaded before he leaves. So Cindy continues to enjoy the life here at the Mexican Resort and Scott goes back to work in Bahrain and we shall see what the next few months will bring. If you happen to be reading this…please take a minute to send Cindy an e-mail. Till our next update….continue to check the SAT Tracker and keep updated to….Where in the World Is Scott. Has it been what we expected….NO it has been so much more with blessings we wouldn’t have even known to wish for.